"There is much to worry about in the mutated world of the future, but Baron Jemmas, Warder of Horn, has more on his mind than most. In recent weeks several of the outlying towns of his Barony have been wiped out by a band of mysterious golden marauders." I've been mediating on Gamma World's Legion of Gold module & wishing that B/X Dungeons & Dragons had followed this adventure's example. Legion of Gold was written in 1981 by Gary Gygax with his son Luke and Paul Reiche III. "This is the first GAMMA WORLD module to be produced by the Game Wizards at TSR Hobbies, Inc. This module includes the main Legion of Gold adventure, several mini-adventures which lead up to it, background information, suggestions for the referee, a special players' map and numerous referee's maps." This module does exactly what it says on the post apocalyptic tin. But today we're going to be talking about the anthology location adventure approach of a Legion of Gold formula campaign set up. The sand box anthology approach allows the DM & the players for that matter to determine the tone & direction of their own home campaign. 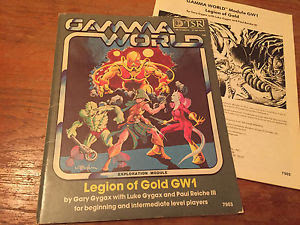 Legion of Gold has been my go to Gamma World module because of its short anthology adventure style. It gives the Dungeon Master just enough with a minimalist approach to the post apocalyptic material to get the DM started. 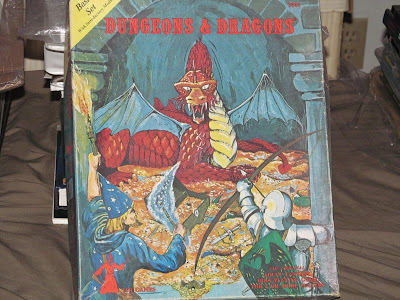 When we start talking about B/X Dungeons & Dragons these mini sessions allow the dungeon master to take a series of miniature adventures & string them together to form an over arching campaign. This approach has been something I've liked & used as old style television episodes in the past. Isolated adventures that form the back bone of an episodic campaign played quickly and with little fuss. 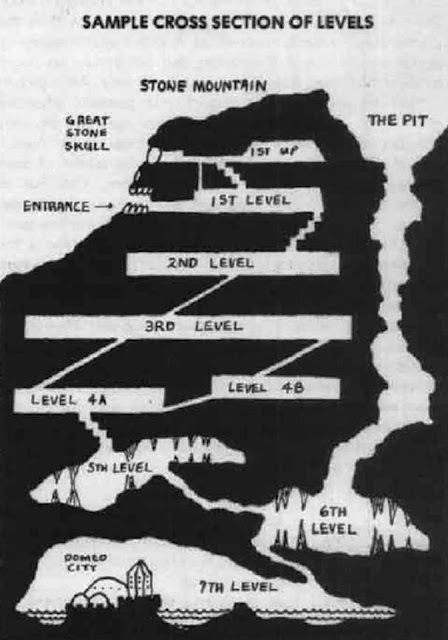 This brings me to the point here of Holmes Dungeons & Dragons with its dungeon of the skull mountain example in the classic rule book. I mentioned this dungeon to a younger friend of mine whose in his twenties & he had no idea that such a dungeon existed. Each room & location within the skull mountain dungeon could be played like a separate television episode forming an over aching epic campaign. Let's take this approach to the next logical step with the Legion of Gold model then we could have a series of small wilderness adventure encounters which take the PC's from first through fourth levels. A mix of ruins, a mini dungeon, & perhaps an underwater adventures. Then bring in something like Faster Monkey Games Skull Mountain adventure which is based on the classic dungeon for Labyrinth Lord. Faster Monkey Games Skull Mountain was six dollars but all of their adventures & supplements have been free for a year or so. Then your cooking up an epic campaign with minimalist fuss & you get to have a convention style game with an episodic set up. I've done a rather long & rambling review of Skull Mountain in the past so I'm not going to retread over old territory. Skull Mountain is a perfect stand alone location based adventure that can stand quietly off in a campaign world. Its ideally suited for a Sword & Sorcery campaign world such as Astonishing Swordsmen & Sorcerers of Hyperborea. 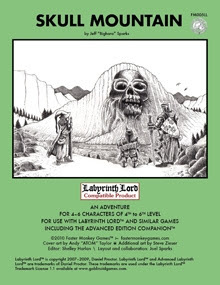 Because of the very nature of 'Skull Mountain' it lends itself to the anthology location adventure approach of a Legion of Gold adventure formula campaign. In point of fact Skull Mountain could be used as both the final goal & big evil of such a campaign. You as the DM don't have to write an over blown or aching script for such a campaign, the players will fill in the gaps, corners, colour in all of the blank spots so fast it will make your head spin. In the down time between playing sessions the action & pulp adventure style will have their imaginations working overtime. The products of their imaginations will become your old school campaign quickly & with very little effort on your part but keep a note book handy.